Few point guards in NBA history have the résumé to go toe-to-toe with Chris Paul of the Los Angeles Clippers. So how can it be that he’s never played in the conference finals? The battle lines on the topic of Chris Paul are well defined. On the one side, you have supporters of Chris Paul, Point God; on the other, a coalition of traditionalists, stat-skeptics and perplexed quants wondering how a player who dominates every advanced statistic we throw at him, and who has had excellent teammates for the last five seasons, has found so little playoff success. At its most basic level, this can devolve into a debate about the usefulness of stats in identifying a franchise player, versus, say, the ol’ Eye Test. Thankfully, Paul’s stature in the league helps fend off the worst of these arguments, but every great troll opinion has its own grain of truth. 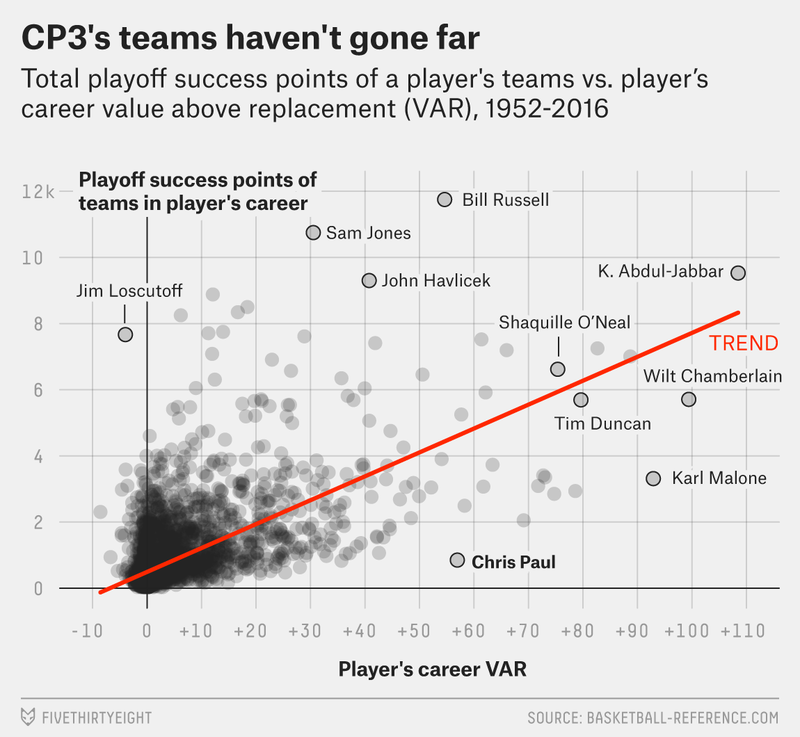 In this case: If every tool available to us says Paul is a Michael Jordan-level player, and if we believe basketball is the team sport most influenced by a single, all-powerful player, how do we explain Chris Paul’s dismal playoff record? SPM (statistical plus/minus) is based on player efficiency rating and win shares per 48 minutes. VAR (value above replacement) converts SPM into a measure of a player’s total value in the minutes he played. But there’s always that pesky question of the postseason: Although Paul’s teams have qualified for the playoffs in all but three of his 11 NBA seasons, they haven’t made it very far once there: They’ve lost in the first round four times and in the second round on four other occasions. And that’s it. In the entire history of the NBA, few players with individual numbers as great as Paul’s have seen so little postseason success. Paul’s postseason numbers are great, though a bit lower than we’d expect given his stellar regular-season stats, even after considering the increased difficulty of postseason opponents. His career playoff averages — a 25.5 PER and .206 WS/48 — are down from his respective marks of 25.7 and .249 in the regular season; those playoff rates mean Paul was worth about 1.3 fewer points (per 100 possessions) to his team than he was in the regular season. The average playoff team since 2006 had a regular-season efficiency differential of +3.6, meaning the level of the competition rises in the playoffs, but we’d expect an individual player’s number to drop by only a fifth of that, since a team’s plus/minus impact is spread across all five players on the court, so Paul’s numbers have dropped almost twice as much as we’d expect them to in the postseason. Of course, some of that shortfall in playoff success points is also just plain bad luck, like when Paul broke his hand during last season’s first round, effectively killing the Clippers’ chances of advancing before they’d really started. And some of it might have to do with the grand plan the Clippers hatched five years ago, when they traded for the game’s best point guard and began taking steps to assemble a championship team around him. In the intervening years, 17 big men4 have led championship squads, as have nine wing players.5 But NBA teams led by point guards have averaged 14 percent fewer dynasty points per season than all others, despite being stronger during the regular season6 on average. Since the end of the Showtime 1980s, it’s been pretty tough to build a championship team with a point guard as its centerpiece. And throughout basketball history, that’s basically been the norm. 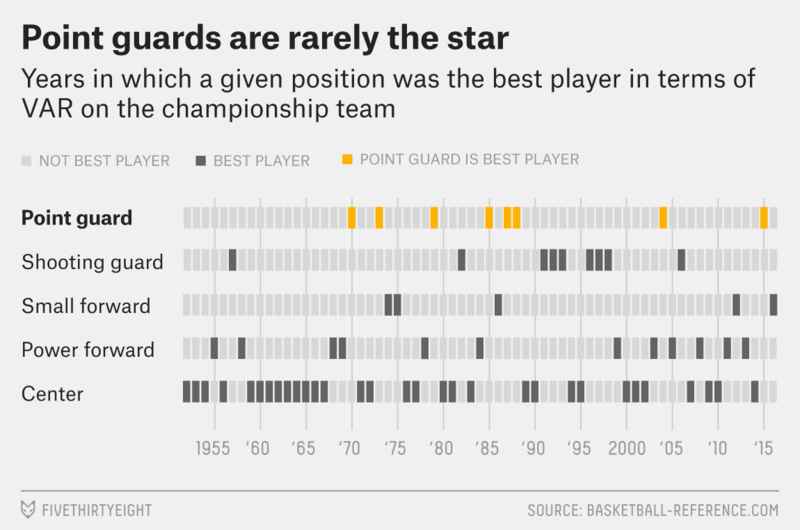 Between the 1951-527 and 1969-70 seasons, zero NBA champions had a point guard as their best statistical player. So in that sense, the 1970s and ’80s were anomalous, rife as they were with championship point guards such as Johnson, Walt “Clyde” Frazier of the Knicks and even the underappreciated Gus Williams of the 1979 Seattle SuperSonics. If we look at the entirety of NBA history, point guard-led teams have been about half as likely to win a championship as their peers, even after controlling8 for how good the team — and its best player — were statistically. Of course, Curry showed two years ago that it can be done — and he might have done it again last season, if not for the injury that slowed him down as the playoffs went on. And although Paul is not exactly the same kind of game-changing revolutionary as Curry, he comes with his own type of basketball genius, which manifests as putting passes exactly where they need to be to maximize his teammates’ chances of making the shot, dominating the midrange-shooting game in a way that actually makes it efficient, and rating as the league’s best defensive point guard (by a wide margin) despite being one of the shorter guards in the league. In other words, as far as we can tell, Paul has all the tools he needs to be a championship player, even though his teams haven’t made a serious run at the championship yet. So either today’s methods of observation haven’t fully captured Paul’s flaws while picking up what he does well (very possible, though less so as more advanced methods — such as plus/minus and player-tracking data — trickle into the stats) or he’s a genuine statistical anomaly. In any case, time is running out. As CBS’s Matt Moore wrote in August, the chance of Paul’s greatness being forgotten — or at least not fully appreciated — grows with each postseason disappointment. He’s played well enough in the playoffs, but whether the cause is bad luck, bad timing or simply that the NBA is not geared for players like him to carry championship squads, Paul has not made the kind of postseason impact that the rest of his résumé deserves. And with Curry’s Warriors gearing up with even more talent than when they broke the all-time wins record last year, it could be another futile springtime for Paul and the Clippers. Check out our NBA predictions. According to the positional designations at Basketball-Reference.com. No, PER isn’t a great stat, and win shares has its flaws as well; FiveThirtyEight readers know we much prefer the plus/minus family of advanced metrics, including box plus/minus (which powers our CARMELO projection system). But BPM is only available going back to 1973-74, and a proper contextualization of CP3’s career needs to include players from earlier eras — your Jerry Wests, Walt Fraziers, Oscar Robertsons and so forth. Fortunately, PER and WS are better together than they are apart, with PER’s love for high-usage players filling in WS’s blind fixation on efficiency. To be precise, I generated the combined version by figuring out the mix of each (relative to league average) that best correlates with Jeremias Engelmann’s Real Plus-Minus. The composite still isn’t better than, say, BPM, but it isn’t bad, either, particularly for comparing players across eras. VAR is structured the same as Basketball-Reference.com’s VORP, right down to the replacement level of -2.0 points per 100 possessions, but uses our PER/win shares composite as its foundation instead of box plus/minus. Shooting guards or small forwards. As measured by efficiency differential. The first season in which minutes played were tracked, and therefore the earliest year where we can track per-minute advanced statistics. Via a logistic regression that attempts to predict a team’s probability of winning the championship based on its regular-season efficiency differential, the composite PER/WS plus-minus of its best player and whether or not that player was a point guard. The coefficient on the point-guard dummy variable was significant and very negative, meaning teams whose best players were point guards were much less likely to win a championship across six and a half decades of NBA history.